If it’s not wrong enough that something we now know to be very unhealthy (cigarettes) were used as a symbol of female empowerment, it’s even more wrong because when I think “You’ve come a long way baby!” I think about boots! In this case, I’m thinking about my ski boots. My first backcountry ski boots were my much-loved Galibier mountain boots. These boots were state of the art for climbing and I was very proud of them. All leather with a stiff shank, they were not meant for skiing but I made them work. I attached them with cable bindings to my metal-edged cross-country skis. This was far from a perfect skiing set-up. It was especially bad for skiing downhill through breakable crust with a heavy pack. However, back then I was on skis just to make it to the base of winter alpine climbs. So, as long as it was after the climb, it didn’t matter that each time I fell, I became like an overturned turtle—anchored to the bottomless snow with my backpack. Eventually, backcountry ski gear improved and I bought a pair of boots and skis just for alpine touring. Then I discovered that alpine touring boots are just as warm as climbing boots, nearly as light and you can fit crampons on them. The tables turned. Whereas before I used climbing boots for skiing, I found I could use ski boots for climbing. One time, while guiding Denali, the lip of my climbing boots wore out and my crampons would not to stay on so I summited in my alpine touring boots instead. For the next twenty years or so, I skied a in my Scarpa Magic alpine touring boots. I loved their comfort, warmth, and lightness. I thought I would never need another ski boot. I was sure I wouldn’t find a better one. Eventually though, the little holes that hold the bindings on wore out. I was devastated. I grieved the retirement and loss of my Magics. We had so many bluebird days together, I remembered them dipping in and out of the powder on every turn, a bright grin on my face. 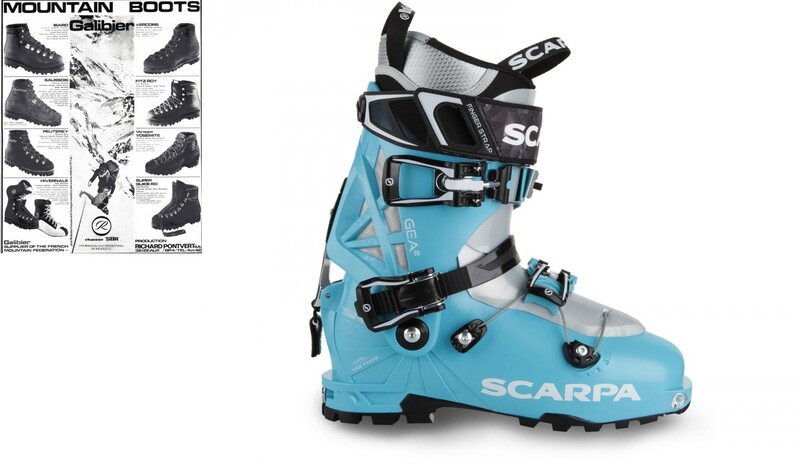 To my extreme relief, Scarpa continues to develop top of the line alpine touring boots and I was able to replace my Magic boots with the also women’s-specific Gea. An all-round performer, the Gea is Scarpa’s best selling women’s ski boot. It is warm and light and fits like a glove. I have no doubt the Gea are as durable as my Magic boots were. and I look forward to adventures shared with my Gea’s for the next twenty years.